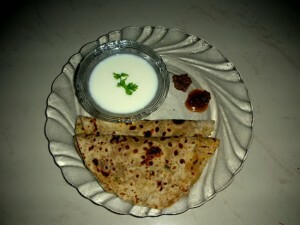 Aloo Paratha recipe by Mariam at DesiRecipes.com. Sieve and mix the flours together in a mixing bowl. Mix well with the flour till butter blends. Gradually add water and knead to a smooth dough. Pat and knead well for several times. Use ghee or oil while mixing the dough instead of butter. Cook potatoes. Peel and mash. Heat little oil and season with aniseed and then fry ginger garlic paste. Add mashed potatoes with salt , turmeric powder and garam masala powder. Fry for few minutes and remove from fire. Mix minced green chillies and finely cut onions, coriander leaves to the potato mixture when it cools down. Flatten each ball and keep a tablespoon of filling inside. Close and seal well all around. Press and dredge in wheat flour and roll out into thick parathas. Heat a 'tawa' ind fry these parathas using oil for both sides while frying. Take one ball and roll into thick and 3 inches width chappathi. Make another of the same size. Place a tablespoon of filling on the middle of one chappathi. Carefully spread it leaving 1/4 inch gap all around. Keep another chappathi on top. Using little water carefully seal both the chappathis all around. Dredge on flour and roll again into big paratha. Gonna make this for Sehri tomorrow.